To coincide with the 2017 Venice Art Biennale, Interlinea has partnered with the Axel & May Vervoordt Foundation and the Fondazione Musei Civici Venezia in the set up and realization of the exhibition Intuition. 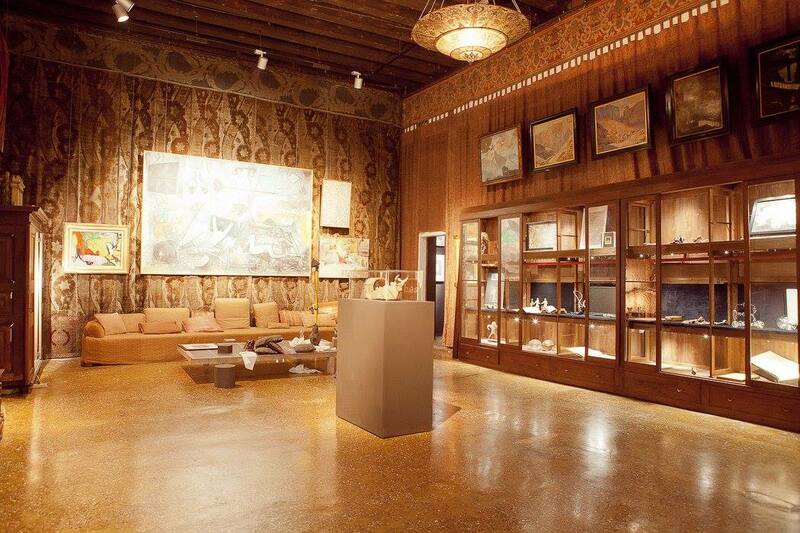 Palazzo Fortuny’s exhibition venue has particular characteristics and requirements that need unique and complex logistical planning and equipment. The location of the Palazzo, its narrow vertical connections, the difficulty of constructing a goods lift, and the small passages make the utmost expertise and professionalism essential to realizing and handling both the setting’s elements and the artworks. The uniqueness of the impressive first floor – the walls completely covered with Fortuny fabrics, and the ceiling from which the fragile silk Scheherazade lamps hang – poses complex lighting and scenic conditions, both from logistical and environmental points of view. Only a great mastery of the exhibition’s set up techniques and technologies can deal with a framework like that of Palazzo Fortuny. Each exhibition detail requires bespoke design and realization, which means the involvement of multiple skills. As the final act of a series of exhibitions that the Axel & May Vervoordt Foundation and Palazzo Fortuny have presented over the last decade (beginning with the 2007 Artempo exhibition), Intuition investigates how intuition has, in some form, shaped art across geographies, cultures and generations. It brings together historic, modern and contemporary works. A concept that unveils itself through the peculiar spaces of the former home-studio of Mariano and Henriette Fortuny, one of the oldest buildings in Venice, in whose rooms many artists, intellectuals and thinkers from around the world have passed time over the centuries. A venue where – on this occasion – some of the artists on show have created site-specific installations (Alberto Garutti, Kurt Ralske, Maurizio Donzelli, Berlinde De Bruyckere and Bruna Esposito). The exhibition receives the visitor by delivering him vigorously to the origin of his own story: as a manifesto of the whole concept, a series of Menhirs from the Neolithic period of ancient European civilizations represent the first attempts by man to create an immediate link between the sky and the earth. The need to come into contact with a higher cosmic energy is still present in the artist thousands of years later, seen in contemporary works such as those of Chung Chang Sup (Meditation 9601, 9604, 9602, 1996), Marina Abramovic (Standing Structure For Human Use, 2017) and Ann Veronica Janssens (Volute, 2017). In the first decades of the twentieth century, the same feeling was understood as the intuitive experience that drives the creative process. Abstract art by Wassily Kandinsky and Paul Klee, and even more so the Surrealists’ interest in the unconscious, are also an important focus of the exhibition, to which the whole second floor of the Palazzo is devoted, presenting a dialogue between the dessins communiqués and cadavres exquis of André Breton, the experiments with camera-less photography by Man Ray, the works of Joan Miró, and some contemporary artists inspired by the automatic writing and drawing method (Robert Morris, William Anastasi, Isa Genzken, Renato Leotta). Intuition is an exhibition of the immense yet elusive title theme, which – as the curators state – simultaneously includes the concepts of end and beginning, from Anish Kapoor’s endless white space and light into which everything disappears (White Dark VIII, 2000), to Otto Piene’s black circle (Schwarze Sonne, 1962-63) – an image of an imminent Big Bang from which everything can originate.